The Aurora Borealis (Northern Lights) is truly one of the World’s greatest celestial phenomenon. A once in a lifetime experience, the Aurora | 360 tour is the ultimate way to experience them. On board a private charter jet, you’ll have the best access possible for seeing the Northern Lights. And with only 80 seats available, this exclusive opportunity comes with serious bragging rights! Scheduled to take-off from Whitehorse, Yukon, Canada between the 7th and the 11th of February 2019, the Aurora | 360 Experience offers 80 passengers an exclusive opportunity in North America, to fly above the clouds, and witness the Aurora Borealis closer than ever before. To see the Northern Lights is an amazing moment in all situations, but to capture them well on camera adds exponentially to the experience. Award-winning Canadian Photographer Neil Zeller, is leading the photography project for the Aurora | 360. “Combine this, with capturing the Lights at 36,000 ft above the Earth, from a 737 aircraft, and now, you can have a bucket list checkmark worthy moment you’ll never forget!” The Aurora | 360 Experience includes an exciting selection of pre and post flight activities such as: Yukon inspired meals, a full evening of Yukon First Nations Astronomy, dance, and culture, as well as a night in the company of four (4) very special guest speakers. a presentation at the new Yukon Astronomical Observatory! Whitehorse based, award winning Yukon Brewing is offering a complimentary Signature Celebratory Gin on-board the flight. 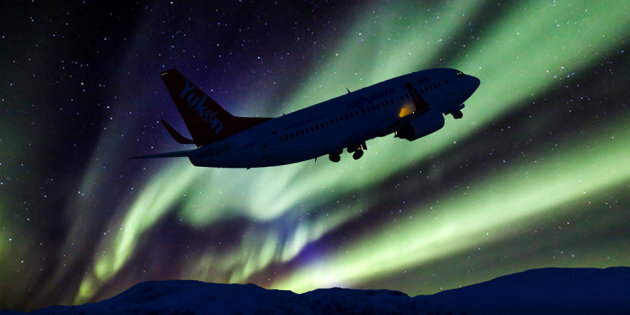 Air North, Yukon’s Airline, will provide Boeing 737-500, non-alcoholic drinks, and snacks during the flight. We are the only ones in the world, with a fully immersive experience package, and have the flexibility to select the better of two (2) nights for our flight, based on the 3-Day NOAA Aurora forecast, to ensure the greatest experience!